Built by the legendary Nautor Swan in Finland, designed by German Frers, Hasty Heart is hull # 1 of the Swan 61 line. First delivered to Monaco in 1985 as Somis II for a few years of casino cruising, then to Cannes France as Modova for day sails to San Tropez. In 1996 the 61' Swan was bought and renamed Hasty Heart to become the last of a distinguished line of yachts with that name owned by Mr. Hart Smith of San Francisco family that built the Mark Hopkins Hotel. Captained by Rick Pearce, she cruised the Med., crossed the Atlantic, cruised the Caribbean, transited the Panama Canal, and nestled into her new home at the San Francisco Yacht Club in 1997. Until his passing in 2007 Mr. Smith entertained countless friends, and friends of friends, on SF Bay, in Mexico and Hawaii. 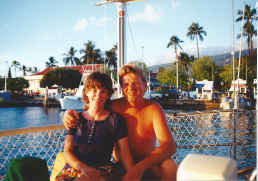 An avid sailor til the end, the photo shows Hart at the helm only months before he passed. Sailing through life together for over thirty years they took possession of Hasty Heart in 2008 from K. Hart Smith after he departed his sailing life at age eighty-nine. Rick began sailing and maintaining a succession of Hasty Hearts on San Francisco Bay in 1975 obtaining his first Captains license in 1983. Bridget participated whenever possible, as well as their five children, delivering Hasty Heart to Mexico sixteen times and to Hawaii six. Their adventures included the yearlong delivery of the current Swan from France around the Mediterranean Sea, across the Atlantic Ocean, cruise of the Caribbean and Transit of the Panama Canal. Now they want to share the experience with you. Ricky knows his way around the deck. As an adolescent, he joined his father on several deliveries to Mexico and Hawaii for the previous owner, Hart Smith. 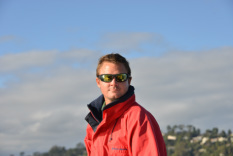 When his parents took ownership of Hasty Heart, Ricky became the first mate and responsible for maintenance of the yacht. Ricky’s good nature and joy of being in and on the water is still clearly evident. As a child, April spent her time aboard Hasty Heart vacationing with the family in Mexico and Hawaii, sailing in the SF Bay, and polishing metal for candy money. Since then, April has made three deliveries to Hawaii and two to Mexico. Preparing food for the crew aboard Hasty Heart on deliveries was a treasured break from, first college, then teaching responsibilities. After eight years of teaching, she has joined the family business. April enjoys talking to clients about chartering Hasty Heart and hosting charters on the San Francisco Bay. Emily enjoys to work behind the scenes at Sail Hasty Heart although you may see her out hosting the occasional charter. She has fond memories of snorkeling with dolphins and jumping off the pulpit into tropical waters while aboard Hasty Heart. In addition to the family's year aboard, Emily has made two deliveries to Hawaii. A resource for website development, marketing, and business organization, Emily has worked with Sail Hasty Heart since its foundation.